Is it possible to live without a car and rely on bicycles for transport around a sprawling regional city with barely a hill in sight? ‘Yes!’, we hear all those people cry who are already relying solely on a human powered vehicle for transportation and making us slightly envious. This leads us onto the next question. If it is indeed possible to live without a car and rely on bicycles for transport around a sprawling regional city with barely a hill in sight…do we really want to? Are we going to feel like getting on our bikes to go and buy groceries for dinner at the end of a long day at work? Will we feel like getting up slightly earlier to ride our bikes instead of driving out to meet our friends for running training? What happens if it rains? And, do we really want to ride to the hardware store to buy fertiliser or tools when a car would be so much easier? These are some of the questions we have been discussing, because, for all our philosophising about hitting peak oil supplies and the bane of the motor vehicle, we still use the car for jobs that could be done just as easily on a pushbike. 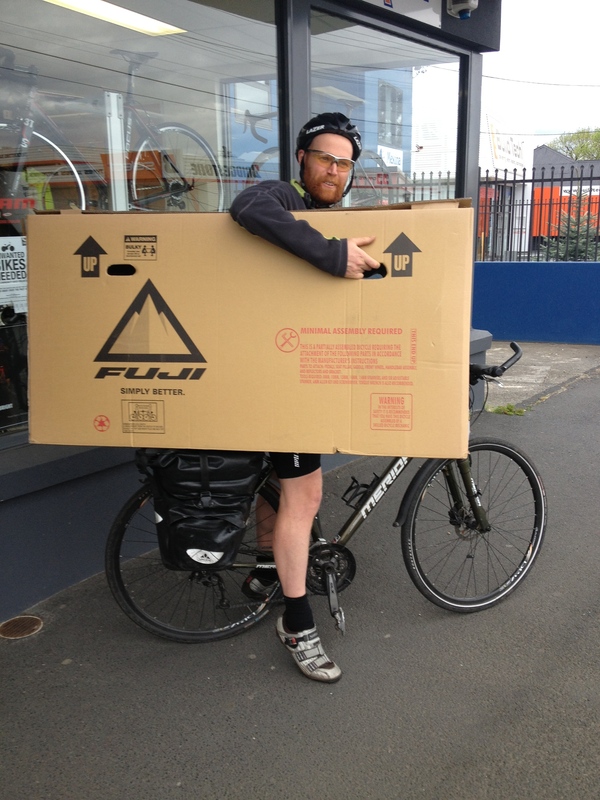 M. has already been working on this as he rides 1.5km to work every day and has so far managed to cart tins of paint, a second bike with a missing wheel and planks of wood to work in the cargo bike. He has not, however, chosen the bike when the car is available to go a bit further and pick up bottles of wine or windscreen wiper blades. After much philosophising, we have decided to dip our toe in the water…it is lukewarm and very shallow, but everyone needs to start somewhere, right? Two weeks from now, I have two weeks of leave from my job. Two weeks in which I will not be required to use a car throughout the day, and two weeks during which time we will test out the moral fortitude of our philosophising. At no point during those two weeks are we allowed to use our car for any reason (yes, I know, if someone was dying and the only way they could be saved was for us to drive them in our car because the ambulances were busy, or invading guerrillas swarmed in off the coast and we needed to escape quickly with the local kids whose parents had died of malaria or some such thing…if those dire and highly unlikely events were to happen we would quite possibly use the car). We will be conducting the grocery shopping, the trips to running training and hardware shops, cafés and friends’ houses, and anything else that may crop up during the two weeks…by bicycle. Hopefully the journey will be a successful and happy one, but regardless of the outcome, you will get to read about the good and the bad as we post regular reports. We hope to inspire ourselves into minimising our reliance on the motor vehicle, and in doing so, we hope to inspire you to maximise your enjoyment of the humble bicycle! 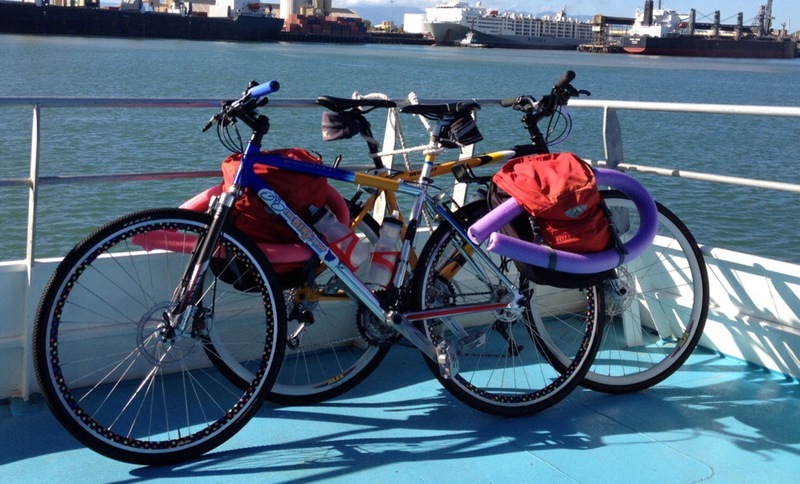 Let us know how you go about using a bicycle for regular transport. Have you ever had to cart something like a piece of furniture or kilos of groceries on your trusty steed? The recumbent looks great with all it’s reflective gear! We can’t really imagine what it’s like commuting in the cold and snow. Our weather is pretty perfect all year round so we really have no excuse!